The setting is in apocalyptic earth, but Acan has a managed to spin the story away from the norm that is characterised by doom, gloom and we are all headed to hell… She takes on a certain wonder and almost playful voice that keeps your attention rapt and leaning in. In the 3,460 worded story, we are introduced to Red – a little wonderer whose inquisitive nature draws you into the story of SunDown. His take and view of the world given his current state make you start to draw conclusions about what the ending will be like. Although, I was slightly amused by Red’s depiction of God, he reminded me so much of Gandalf. This leads me to mention the clever way in which Acan brought in the aspect of the ancient scriptures in moments that called for them. Now that, was brilliant! In conclusion, this is not your usual apocalyptic themed story, this is one last-days story that you wouldn’t have too much of a hard time believing would happen. 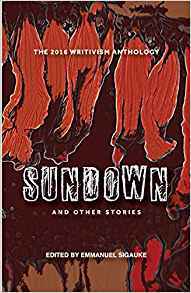 SunDown by Acan Innocent Immaculate was announced as having been shortlisted for the Writivism 4th Annual Short Story Prize. It has now been published at Munyori Literary Journal head on over there to read it yourself.